On April 8, Kerala had its third dawn-to-dusk hartal of the year, and second of the month. On these days a sense of disquieting calm settles over the state. Public life comes to a halt: most vehicles are off the roads; markets and malls remain closed; attendance is abysmal in government offices; universities postpone examinations. A couple of KSRTC buses and a few government offices are vandalised and as always, there are stray incidents of stone pelting. There’s another, quite recent feature common to this phenomenon: it’s a field day for the haters. Ever since a globalised Malayali middle class emerged in the last 20 years, private discussions in the confines of homes, clubs and social media are laced with much ranting and laments over “human rights” violated by a “barbaric, outdated” mode of protest. They piously bemoan the loss to the exchequer. A few volunteer groups (one a Royal Enfield bikers group) venture out to rescue those stranded at railway stations. The hashtag #saynotohartal trends for a while on Twitter. After dusk, a few state-run liquor outlets are the first to open. Before long, the routine long queues of twitchy yet scrupulously disciplined men appear. The next morning, normal order is restored with an ease that makes the hartal seem like a fever dream. On the same day, another protest, blacked out by the media and so under the radar of the righteous brigade, reached its 100th day. It began on December 30 last year when six saleswomen at the Kalyan Sarees showroom in Kovilakathumpadam, Thrissur district, decided to sit down. The irikkal samaram (sitting strike) by Padmini S. K., Mayadevi P., Devi Ravi, Rajani Dasan, Alphonsa Johnson, and Beena Sojan under the Asanghaditha Meghala Thozhilali Union (AMTU, meaning Unorganised Sector Labour Union) banner has continued outside the showroom since then. But they had to take the day off because on April 8, there were no buses or motorcycle clubs to take them to the protest site. Indeed their strike has been broken only by the hartals. All these women ask for is the right to sit, among other equally simple things. – Implement an eight-hour work schedule. – Re-arrange break timings and make provisions for the salesgirls to sit. – Stop making women employees work after 7 p.m.
– Cancel the transfer orders. They want the management to formally acknowledge that salespersons have the right to sit down at work; that they won’t greet customers with plastic smiles when the only thing on their mind is a toilet break. When they were working, hartals were a welcome relief, a day when they could forget about most things. Now, a day at home is unwelcome. When we are at the site, there is hope that the strike will succeed. There are people watching. Some discussion or the other is always going on. But when we’re alone, doubts start creeping in: what is going on in our lives? What have we got into? “When we are at the site, there is hope that the strike will succeed. There are people watching. Some discussion or the other is always going on. But when we’re alone, doubts start creeping in: what is going on in our lives? What have we got into?” says Alphonsa Johnson (42), one of the protestors. Her husband, Johnson, incidentally, has been waging a protest of his own for better salary at the medical shop where he works. Being at home for an entire day also means a longer than usual interaction with family, something that has become more distressing with every passing day. Beena Sojan (39) lives in a rented house with her husband and younger daughter, and has had no support from her family since the beginning. Her husband, a daily wage labourer, lost his job while she was on strike. And after the recent marriage of their elder daughter, they have a debt of Rs 1.5 lakh to pay off. Padmini S. K. is 42 years old and a widow since her husband—her childhood sweetheart—died in a car accident 15 years ago. She has two sons, the elder of whom has given her a week’s ultimatum to sort things out. A contract labourer, he is certain the strike, of which his mother is the convener, stands no chance. The younger is sympathetic, but she knows she can’t go on challenging her elder boy. “In some situations, there is only so much a mother can tell her son,” she says. Devi Ravi’s situation is worse. Her son Akhil Vishnu works in the same showroom and the management front him with relish as testimony to not just their own righteousness, but also to the “malevolence” of the protestors. “If we were intent on revenge against these women as they claim, why should we keep the son on? In fact, after they started their strike, we increased his salary. And they still spread lies,” says Shiva Prasad, the public relations officer. Devi Ravi would like her son to join her (“which mother wouldn’t?”) but says she doesn’t have the moral right to ask him. Her husband is a hotel employee and Akhil is a college student who funds his education from what he earns from the showroom. Even when Devi was working, what she earned—Rs ,000 till a year ago and Rs 7,000 from August 2014, after the employees stood firm in their demand for a hike—was inadequate. “It is our helplessness that makes us take jobs like these. Can you imagine how bad our working conditions must be to be forced into a strike like this?” Devi says. Even Rajani Dasan (38) and Mayadevi (40), whose families have been supportive throughout, are affected by the burden the strike has imposed. Rajani’s husband is a painter and they have two children. Mayadevi’s husband works in a bakery and they have two children too. None of the women have any experience with activism. They are “poor, ordinary, middle-aged women with not much education and a lot of financial problems”. Irikkal samaram is not just the first strike for them but also the first they have paid attention to. “Earlier, when I saw people striking, I sneered: couldn’t they just shut up and work?” says Mayadevi. But now she tells her son and daughter to try and find out what is going on if they chance upon a group of protestors. In the first week of the strike, they held a press conference at the Thrissur Press Club for which they had to pay Rs 1,500 as rent. None of the news channels or newspapers carried a report. 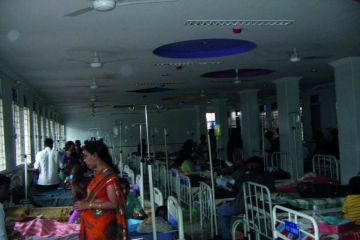 The women are aware of the management’s monetary power, and have a vague idea of the money earned by media organisations from the Kalyan group and other prominent textile and jewellery retail chains—unofficially estimated at Rs 200 crore per month—but they didn’t expect a total blackout of their strike. “We didn’t expect them to strike with us. But they could have reported a strike like this is taking place,” says Mayadevi. Like every other protest irikkal samaram is the reaction to a firmly entrenched system of exploitation. One of the most contentious parts of their terms of work is that they can’t sit down at any point in their normal 11-hour day. It seems a deceptively minor sticking point but there are major consequences. Most of us have uterine problems, urinary infections, and varicose veins because we keep standing. Managements across the board seem oblivious to what sounds like an obvious occupational hazard. But the immediate provocation for the strike was transfer orders to the six women without notice on December 11, 2014. While Kalyan Sarees maintains the transfers were routine, the women say it was aimed at muzzling dissent against a work culture that both the management and, to an extent, the public take for granted. A week before the orders, the six attended the AMTU convention at Kozhikode and got themselves union tags. They joined four months ago, after learning that a union existed for unorganised labourers. Experience—both at Kalyan Sarees and other showrooms—showed that singular acts of defiance ended invariably in termination. “Someone you work with today won’t be there tomorrow, and you’re so frightened that you wouldn’t try to remember such a person existed,” says Mayadevi. On May 1, 2014, AMTU, based primarily in Kozhikode district then, organised a sitting strike of textile workers at Kozhikode. Until they heard about it, the women had not even thought of a union. “For employees in the sector, in particular for women, there are no unions. The mainstream unions are not interested in our problems. What attracted us to AMTU was that it was exclusively for workers in the unorganised sector. Moreover, women had a great say,” says Mayadevi. They inducted fellow workers into the union. Stringent frisking measures—by male security guards—and the presence of an intensive surveillance network—there’s a camera in front of the toilet—meant even bringing a union notice inside and passing it along was an adventure. “There was fear and a high we had never known before, but above all, there was a sense of hope. We knew we were on to something,” says Padmini. Out of the 210 sales staff in the showroom, they managed to induct 31 more salesgirls into the union. The news spread fast, so fast that it had to reach the management’s ears. Local labour is a key part of the retail store work culture for women. Men are fine with their wives working in showrooms nearby where colleagues are mostly women. Padmini refused to sign the order. She asked for a meeting with the general manager and decided to resign. She was denied the meeting and told to leave immediately. The next day the six women were denied entry at the gate. 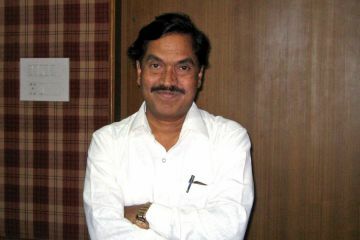 He goes on to recommend the dispute, in accordance with the 1947 Industrial Disputes Act Section 10 (1) (D), to the judgment of Palakkad Industrial Tribunal. In the meantime, Sara Joseph, one of Malayalam’s greatest novelists, a pioneer of the state’s feminist movement, and the face of Aam Aadmi Party (AAP) in Kerala, made a futile attempt at a settlement through a publisher based in the district. It was through Sara Joseph that the women initially linked up with AMTU. After this failure, and after the management toughened its stand in a meeting chaired by the district collector, a samara samithi (strike committee) was formed of the six protestors and their closest relatives—either their husbands or son. An aikyadardya samithi (solidarity committee) was also formed with P. K. Lijukumar, state president of AMTU, as convener and Yamini Parameswaran, a human rights activist, as chairperson. The charter of demands was prepared and the political agenda laid out—the right to organise and claim their legitimate rights. As arrangements were underway for the inauguration of the strike, the management, through a local television channel called Channel 4U, approached the protestors with a compensation offer of Rs 50,000. It was rejected. On December 30, a strike notice was issued under the AMTU banner and inaugurated by K. Venu, a firebrand Naxalite during the Red Seventies. 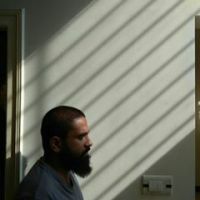 He later became a trenchant communist critic in the globalised Nineties, and is now one of Kerala’s foremost, habitually provocative political observers. If you want a primer on the major textile and jewellery retail chains in Kerala, travel on a state highway for half an hour or spend roughly the same—even less—time in front of a television set, flipping through Malayalam channels. On the giant roadside hoardings you have, from Amitabh Bachchan to Mohanlal and from Manju Warrier to Shreya Ghoshal, the biggest names in Indian and Malayalam cinema, persuading you to the glamorous showrooms of brands they are paid exorbitant sums to promote. The showrooms are numerous and usually crammed full. The textile and jewellery retail sector is the major revenue source for all Malayalam channels. The brands don’t discriminate and, for their part, channels are prudent enough to confine their ideological positions to editorials: even anti-corporate/anti-establishment news channels comply with the wishes of their paymaster. The ads are a riot of ostentation. They claim to uphold the ideals of a great and mythical Indian tradition but in reality promote an exclusively Brahminical, upper class consumer lifestyle. The ads are a riot of ostentation. They claim to uphold the ideals of a great and mythical Indian tradition but in reality promote an exclusively Brahminical, upper class consumer lifestyle. The sleek taglines connote familial bliss. Kalyan Jewellers, for instance, has the hit tagline: Vishwasam, athalle ellam? (Trust is everything/ Isn’t trust everything?). Jos Alukkas, another prominent brand proclaims Ithu ponnil theertha bandham (This is a relationship made in gold). Kalyan Sareesowned by T. S. Ramachandran, is part of the Kalyan Group. His brother Kalyanaraman, who owns Kalyan Silks and Kalyan Jewellers, is the group’s more famous and richer face with a net worth estimated by Forbes at $1.03 billion. Kalyan Sarees, on its website, claims to have “looms across the country, where thousands of master weavers design the best in silk saree matching the latest designs”. The tagline of Kalyan Sarees reads Stories Crafted in Silk. It is a tagline Padmini uses for the narrative of her life as a salesgirl. Here’s her story. “My name is Padmini S. K. I started working as a salesgirl in 2005. It was a fairly small shop at City Centre. My salary then was Rs 500 per month. When I first went there, I had no idea how the job would be. All I knew was that I did not have other options. “On the first day, I was told about the rules of the job. First and foremost: a salesgirl should never think about sitting down. Not even when there are no customers. You don’t have to ask why. That’s just how it is; that’s how it has been ever since there were salesgirls. So from 9.30 a.m. to 7.30 p.m., I should stand. There won’t be any specific toilet breaks in between. In the showroom that I joined, there was not even a toilet. So I used to go out to a hotel, or to the corporation office to relieve myself: and only once a day, maximum twice. Sometimes, not even that. “Through the course of my career, one thing I have heard many of my bosses say when we ask for a toilet break is this: ‘why don’t you attach a hose pipe under your sari?’. People say a woman’s life gets better and she becomes stronger when she has a job of her own. But do you know what happens to her self-respect when she keeps hearing comments like these? “I thought things would get better if I moved to a better, bigger showroom. Anyway the shop I worked in was suddenly shut down, and I had to find a job. Luckily, more companies were entering the market at that time so it wasn’t that difficult. That, I would say, is the only good thing about this profession. There are enough shops and there are always new ones coming up. So there’s always a job for you if you are willing to be a slave. “After working in the showrooms of a few big brands, I joined Kalyan Sarees in 2012, about the same time when they opened the showroom. By that stage, I had worked my way through to be a sales supervisor. I was fortunate in this regard. The standard hierarchy among sales employees is that men will be the supervisors and floor managers while women will deal with the customers. This works well for the management because the women who work in this field are usually meek and are afraid to challenge the supervisors. “I was offered around Rs 8,000 in the interview. But when I joined, the management told me that even those with 10 or 12 years of experience was given only Rs 6,500. They might have lied to me about my salary, but what they said about the salary of those people was true. Most were paid around Rs 4,000 to Rs 5,000, and the really experienced ones were paid around Rs 6,000. None of us knew that there was a Minimum Wages Act or that we were rightfully entitled to a minimum salary. “Once I became the supervisor, even those salesgirls who were earlier my friends suddenly distanced themselves from me. Once I was not one of them, I became part of their opposite camp. This was emotionally very draining for me. But that is a different story. “For a salesgirl, work starts at 9.30 a.m. Imagine this: Rs 4,000 for a minimum of 11 hours of work. Amounts for provident and welfare funds are deducted from this, without any legal acknowledgement. We are not given salary slips. Maybe I should have been careful from the start: after all I was not given an appointment letter either. Then we demanded higher wages, and initially the salary was hiked to Rs 5,000 and in October last year to Rs 7,000. Even then we did not know that according to law, we should have got at least Rs 7,200. Or that according to law, women are not allowed to work after 7 p.m.
“We have two casual leaves a month, but the management decides when we can take them. We have a lunch break of 20 minutes and we have to eat on the fifth floor. We are not allowed to use the lift to go there. The less said about the place the better; to even be asked to go and eat there is a punishment in itself. If it is raining, we get drenched. Many days, we don’t even bother to have our lunch. Even when there are no customers, we are not allowed to sit. So what we do is this: we put already-folded clothes on the floor and then pretend that we are folding or arranging those clothes again, and in between we steal a moment to sit. But now with cameras everywhere, these stolen moments have become rare. “Even when there are no customers, we are not allowed to sit. So what we do is this: we put already-folded clothes on the floor and then pretend that we are folding or arranging those clothes again, and in between we steal a moment to sit. But now with cameras everywhere, these stolen moments have become rare. The 100 days of irikkal samaram without the assistance of mainstream political parties and trade unions saw various civil society alliances form and collapse. Initial mobilisation was through a poster campaign and automobile rally. The posters targeted sales staff of other shops who did not need much convincing. Soon, news started to spread within the district. The strike committee and the solidarity committee, however, decided against involving more employees. It was considered too big a move at a stage when the strike was beginning to gather momentum. Yamini, its chairperson, feels it was the wrong decision. From the start, all major political parties and affiliated trade unions distanced themselves from the strike. Sara Joseph was the most prominent mainstream presence in the sit-down pavilion. In her inimitable style, she reiterated the significance of movements like irikkal samaram, shared jokes and anecdotes, and sang with them. But unlike her past avatar as writer and feminist, this time she was primarily AAP’s face. It led to tension between her and the strike committee. In the meantime, the management approached the protestors again with an offer mediated through an AAP leader. This time it was Rs 1 lakh. This was also rejected. The strike then had its first major success. The management implemented a host of changes which addressed some of the issues raised. Salaries were hiked from Rs 7,000 to Rs 7,200, in accordance with the Minimum Wages Act. Stools were provided, meeting one of the demands the protestors had formally made in their notice. But the staff were still not allowed to sit. The lunch space on the fifth floor was cleaned. A register with employee details appeared for the first time. They were given salary slips. Documents were provided for money deducted from the salary for PF and welfare fund. Ironically, once these demands were met, support from showroom staff vanished almost entirely. For the protestors, this was a painful blow, so much so that even close friendships were broken beyond repair. “We are not saying they should have come out and protested with us. But they could at least acknowledge that the benefits they enjoy are a result of our strike”, says Mayadevi. She is sensitive to the pressure employees are under, but disappointed that even in private no one recognised the value of their struggle. The woman who spoke on condition of anonymity, however, feels they were let down by the protestors. “Even after we expressed interest in joining the protest, they never tried to reach out or to understand the duress we were under. The strike was always about people from the outside and their support. And for people from the outside, this is one big drama, a war between hero and villain. For us, it is first and foremost a question of livelihood,” she says. From that point on, the strike was mostly about the cancellation of transfer orders. The six women stood firm: getting back to work at the showroom from where they were transferred was the only acceptable solution. The management made it clear no talks would be held with AMTU: the issue, according to them, was an internal matter, a family problem. The management was emboldened by the fact that AMTU did not have official registration. To further complicate matters, there was another barely functional trade union registered under the same name. As the strike gained impetus, a solidarity convention was announced on January 21 at Kerala Sahitya Academy, Thrissur. The evening before, the management offered to take back the women to a different showroom in Thrissur. The committee said it would be acceptable only if three went back to the Kovilakathumpadam showroom and three to the management’s choice. It did not respond to this condition. The convention witnessed a crowd unprecedented for a trade union protest not conducted under the auspices of CITU or INTUC. Even unions that had stayed away till then sent representatives. However, despite repeated requests from the strike committee to send women, every single union had men representing them. On the same day, Sara Joseph informed the strike committee about another offer by the management. The women would be taken back to the same showroom as clerical staff. The protestors said it was a sly move to get rid of them permanently. This position, unsurprisingly, strained relations with Sara Joseph. However, such was Sara Joseph’s stature that there were apprehensions of a backlash if the offer was rejected. For a protest heavily reliant on civil society goodwill, perceptions matter; so the strike committee, according to Lijukumar, could not give the impression of obduracy. After various deliberations, it was eventually decided to accept the offer and call off the strike. But when the letters of appointment arrived, the women’s stand was vindicated: it was not as clerks in the showroom at Kovilakathumpadam, but as employees at a godown that was not opened yet. The offer was rejected. It also marked the end of Sara Joseph’s association. In the following days, many withdrew from the solidarity committee, citing differences with the way the strike was being conducted. Among them was K. Venu who had inaugurated the strike. He felt it had started to resemble a traditional trade union protest. This stance was keeping in line with the trajectory of his political thought after he deserted the radical left and reinvented himself as an advocate of parliamentary democracy. For a long time, Venu has been unrelenting in his denouncements of Marxist trade union culture, dismissing it as anachronistic, anti-democratic, and against the interests of labourers. The strike had support from an enthusiastic section of social media. A Facebook solidarity committee was formed which planned a march to various Kalyan group showrooms. Mainstream media came in for vicious condemnation. On March 8, as part of Women’s Day, a solidarity march was held by this committee. For the women, it was a welcome surprise. There were interesting asides too. After she put up a Facebook post thanking her “dear Kalyan family”, there was a torrent of abuse—supposedly motivated by political rage but mainly chauvinistic—directed at Manju Warrier, Kalyan Jewellers’ brand ambassador and a feminist icon since she split from her superstar husband Dileep, and made a comeback last year following a 15-year hiatus from films. Social media has been a prominent feature of Kerala’s political topography in the last couple of years. Some of the major protests mobilised in this fashion include the nilpu samaram of the Adivasi Gotra Maha Sabha; the Kiss of Love protests against moral policing after a restaurant in Kozhikode was vandalised by the Yuva Morcha; the mailing of sanitary napkins to the managing director of ASMA Rubber Products Private Limited Ltd based in Kakkanad, Kochi, following allegations of 15 employees being subjected to strip search after a sanitary napkin was discovered in the company bathroom; and the Pampa Menstruation strike which called for women to fill KSRTC special buses to Pampa, Sabarimala, with menstruating women after Naseera, a journalist with TV Now was asked to step down from a bus by its staff since they felt the presence of women would interfere with the purity of men. Only Kiss of Love was covered by the mainstream media. Though the strike was against Kalyan Sarees, it was Kalyan Silks whose image suffered more. T. S. Kalyanaraman-owned Kalyan Silks is the bigger and more prominent of the two. The strike committee made it a point to publicise the strike as against Kalyan group, and social media followed suit. “The situation is no better in Kalyan Silks or, for that matter, any showroom of the big brands. I think we were ethically vindicated,” says Lijukumar. “Even the brand ambassadors of Kalyan Silks and Kalyan Jewellers address the group as their Kalyan family. Why shouldn’t we do the same?” asks Yamini. The management of Kalyan Silks sent messages to the strike committee asking it to specify that the strike was against Kalyan Sarees. This insinuation of lax morals is not the first time they have heard it, and they know it won’t be the last either. “Initially we were affected, but now who cares?” says Padmini. In the second week of March, the strike achieved its second major success when the management decided to reschedule the working hours of women sales employees from 10 a.m. to 7 p.m. (They were still, however, expected to be present at the office by 9.30 a.m.) Breaks were also provided in between. The strike by now had gained enough mobilisation for V. S. Achuthanandan, the leader of the Opposition, to raise a submission about it in the Assembly. In his reply, Shibu Baby John, the labour minister, said the existing labour laws were inadequate to take action against Kalyan Sarees. In the first week of April, the management invited the six women for compromise talks. It had made it clear that talks would not be held in the presence of AMTU representatives, and that negotiations would be held on an individual basis. The negotiations were mediated through AITUC, the trade union affiliated to the CPI, after V. S. Sunilkumar, a CPI MLA expressed interest in finding a solution to the issue. In the meeting, the management proposed that the women be posted at a depot to be opened at Chembukavu. This was the same offer made through Sara Joseph in January. But if just a letter was offered then, this time the management wanted to enter into a legal agreement. They were also assured that in case the depot closed down, they would be relocated to branches of the company in Thrissur. The offer split the protesters into two camps. Padmini and Rajani were against the proposal. “This was the same offer that was made three months back. We did not accept it then, so why should we give in now? And in any case, it was for the right of trade union activity that we had fought. If were to sign this agreement individually, it would only mean that we have conceded defeat in that fight,” says Padmini. She also points out that none of the women have any experience in working in a depot—“an exclusive male space”—where the tasks include sorting, tagging and billing. 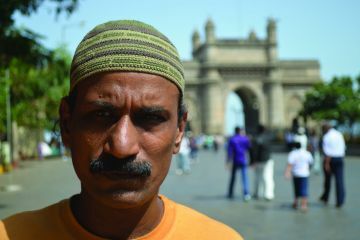 At 9 a.m. on April 9 , the day after the hartal, five of the six protestors, P. K. Lijukumar, and Augustine, a retired irrigation officer and a man of few words who comes to the pavilion every day in solidarity—“like a caring guard”, according to them—arrive. Devi Ravi has taken leave due to health issues. The women, as they have been from the first day of the strike, are dressed in their uniform saris which, Padmini says, are expensive. When saleswomen join a showroom, companies provide uniform saris. Once they get old, they have to pay for new ones. And in a line of work reliant entirely on commodity fetishism, they have no choice but to present themselves as perennially smiling, perennially pleasing-to-the-eye commodities. To appear at the workplace in a worn or shabby sari is not an option. “Because we go to work like this, even those close to us think we lead a cozy life. The saddest part is that even our stories of misery are sometimes taken for granted as small sacrifices to be made for a glamorous life,” says Padmini. The sit-down pavilion is on the highway side opposite Kalyan Sarees in front of a building under construction. The area was once a paddy field. A pile of red sand abuts the pavilion on one side. A surveillance camera in front of the showroom is aimed directly at the pavilion. The banner is a red cloth on which a brief description of the strike is printed. It is tied and held aloft between two posts on either edge of the pavilion. Two wooden cots and a few plastic chairs sit inside. There are posters and banners of various organisations that pledged support. An assortment of notices and posters lie on the floor. Paper toys made by Subid Ahimsa, a human rights activist and a post-graduate from IIT who found his vocation in making toys from waste, are strung to the edges of the coconut leaves. Subid has been a regular presence at the pavilion, someone for whom the women have great admiration. It’s a sweltering summer day, made more insufferable by a dizzying cloud of smoke and noise from an endless stream of highway traffic. Consumers keep going in and coming out of the showroom. The strike, unlike what optimists and idealists would like to believe, has had little impact on the consumer society. Labourers, mostly migrants from east India, toil in the building under construction. There are curious glances cast at the pavilion and the protestors from inside passing vehicles. A few familiar presences come and go. In between, a stranger comes in, expresses his solidarity, and sits for a while. Once he leaves, Padmini wonders with a hearty laugh if he was a Maoist. An intensive and entirely unsuccessful Maoist hunt has been going on for a while in Kerala. A few human rights and environmental activists have also been targeted—a couple were arrested and released in bail—while the office of Keraleeyam, a Thrissur-based magazine that focuses on environmental issues, was raided for alleged Maoist links . The women, in visible discomfort, laugh him off. In the evening, there is an open discussion on the stance to be taken on the new offer. Padmini and Mayadevi take opposing positions. The rift that has emerged after all these days has left them visibly disturbed. They struggle to choke back tears as they speak. Mayadevi counters that the strike has unfortunately started to move away from being a political struggle to a clash of egos, and for her and three others—Beena, Alphonsa and Devi—it is not a privilege they can afford. Both Padmini and Mayadevi, after their emotionally charged statements, make it clear that the differences are political, that their friendship remains unaffected. As the evening gets darker and salesgirls from the showroom start coming out, the five women get ready to go home. The salesgirls make a conscious effort to avoid eye contact with the women. But once they leave the site and reach the bus stop, there is no way to distinguish them from the salesgirls: they’re wearing the same uniform. On April 14, the 106th day of the strike, the women accepted the offer and signed the agreement. No representative of the union was present. Yamini signed as a witness, representing the solidarity committee. The women were paid for the days they were on strike. The case at Palakkad Industrial Tribunal Court was withdrawn as part of the agreement. For Mayadevi, this was not the time for introspective analysis.“Tomorrow is Vishu—Kerala new year—and I think I deserve a break from all this,” she says. Of the four demands the protests had laid out in their charter, two were fully met, while one was partially acknowledged. The demand for an eight-hour schedule was not considered.